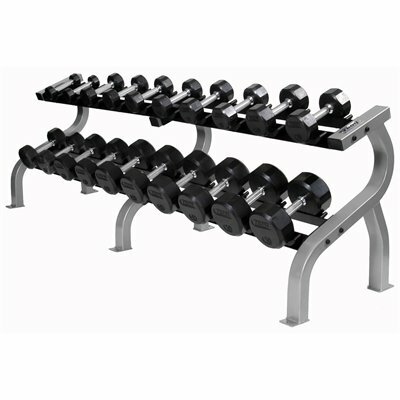 This set includes a pair each of 55-100lb Iron pro-style Hammertone Dumbbells with Rubber Endcaps and Contoured Chrome Handles in 5lb increments. Troy Iron Pro Style Hammertone Dumbbell Set 55-100 HFDC-R are all pre-assembled to ensure that they meet the standards required in heavy used commercial applications. 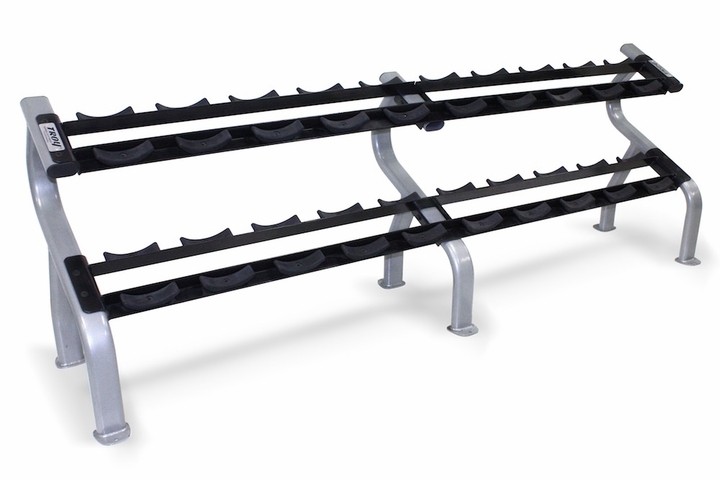 All pro style dumbbells use solid steel bolt design and are bigger longer and stronger than the competition. These dumbbells consist of contoured handles that feature special deep set knurling for functional performance and top of the line Troy high grade hammertone-gray plates. The rubber encased endcaps include the Troy name and numbers for easy identification.Includes one pair each 55-100 pound dumbbells in 5 pound increments Gray plates rubber endcaps contoured handles. Our TROY pro-style rubber dumbbells are all pre-assembled to ensure that they meet the standards required in heavy used commercial applications. All of our pro-style rubber dumbbells use solid steel bolt design; bigger, longer and stronger than the competition. These dumbbells consist of contoured handles that feature special deep set knurling for functional performance and our top of the line TROY high grade Hammertone-gray plates. The rubber encased endcaps include the TROY name and numbers for easy identification. Call 1-800-875-9145 to speak with one of our fitness agents with any questions you may have about theTroy Iron Pro Style Hammertone Dumbbell Set 55-100 HFDC-R. Don't hesitate order your Troy Iron Pro Style Hammertone Dumbbell Set 55-100 HFDC-R from FitnessZone.com today! 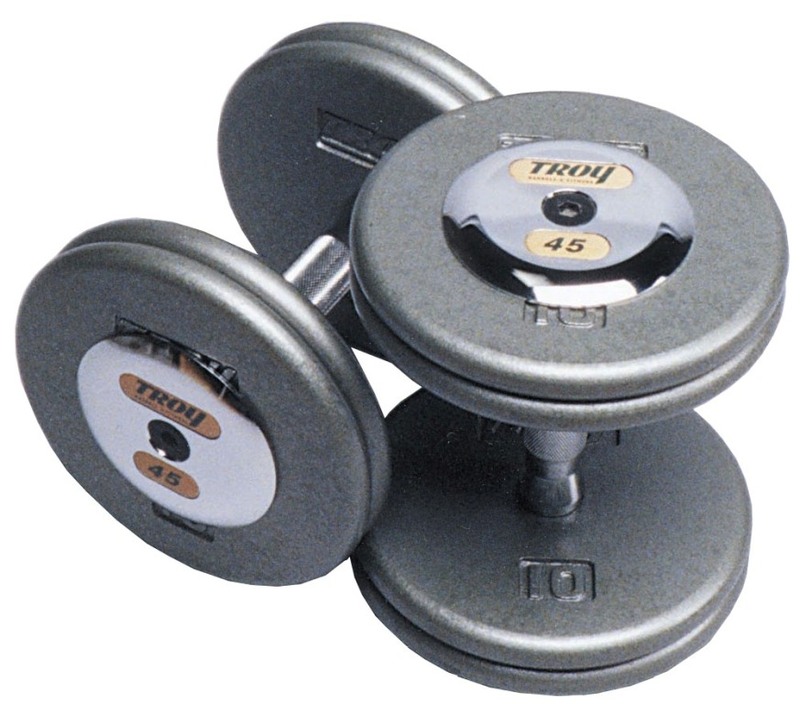 Order your Troy Iron Pro-Style Hammertone Dumbbell Set 55-100 HFDC-R from FitnessZone.com today!